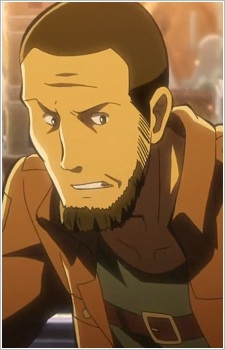 Mitabi Jarnach (ミタビ・ヤルナッハ Mitabi Yarunahha) is a member of the Stationary Guard in Trost District. Mitabi first appears in Ch. 13 as the leader of one of the units assigned to protect Eren on his mission to plug the breach in Trost's Wall created by the Colossal Titan. When Eren loses control of his Titan form, Mitabi advises Ian to abort the mission and retreat to the safety of Wall Rose; however, Ian orders him to continue defending Eren. In Ch. 14, Eren regains his senses and begins carrying a boulder to plug the breach in the Wall. As there are too many Titans to fight them all, Mitabi and his men instead use themselves as bait to lure the Titans away from Eren, sacrificing their lives to ensure the success of the mission.